I wish I could read this right now! I need some time travelling fun in my life. 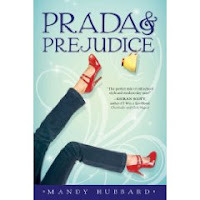 I can't wait to see how 1815 reacts to Prada heels! gah! so jealous you got to read this one. i REALLY REALLY want to read it and even more now that you loved it. I can't wait for this to come out. It sounds so good and I love anything P&P related. Great review! I think Mandy's got a big hit on her hands! Can't wait to read it!! I am SOOOOO excited to read this one--everything about it has me interested and I love the awesome cover! I am DYING to read this one! Lenore-I couldn't pass this one up-I love time travel! Erika Lynn-I hope you get to read it soon and love it too. Debbiesworld-I know, isn't that cover so cute? Lisa-I think it's going to be a big hit too. I can't wait to read more from Mandy. Thank you for posting this! I've been wanting to get a copy forever, and it's great to hear someone's opinion about it. This book looks pretty cute. Good review. Totally putting this on my "to be ordered" list!! I just read the ARC. The book was cute and I really like how 1815 Callie changes 21st century Callie. Thanks for giving me the tip.